Editor/Author Turner, Stephen P. and Roth, Paul A. The Blackwell Guide to the Philosophy of the Social Sciences collects newly commissioned essays that examine fundamental issues in the social sciences. Breaks new ground by including key new areas of inquiry in the social sciences: cognitive science, feminist philosophy, evolutionary accounts of social life, rational choice theory, and causal modeling. 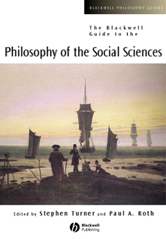 Presents a state-of-the-art guide to the hottest philosophical issues in the social sciences. Written by an international assembly of contributors.